Moldable earplugs are putty-like and generally made of either silicone putty, or wax with cotton fibers embedded. These can be reused a number of times, until the oils from your hands and skin degrade their tackiness or the plugs otherwise become dirty. Moldable earplugs are a good choice for those who cannot wear other types of earplugs; these plugs are extremely comfortable to wear, as they conform to each unique ear shape. 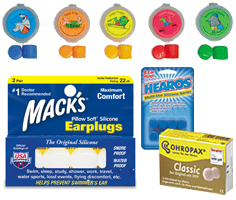 Moldable ear plugs are also an excellent choice when you need to keep water out of your or your children's ears. They are safe and easy to use, and because moldable earplugs are not as effective in blocking sound, your kids are more likely to hear you when you yell at them in the pool. There are two basic categories of moldable ear plugs: moldable silicone ear plugs, and moldable wax ear plugs. TIP: We recommend wax earplugs for sleeping because the wax is softened by body heat, letting them conform to your ears for the most comfortable sleeping plug you can get, even when you lie on them. For swimming outside, we recommend moldable silicone because, unlike wax earplugs, moldable silicone putty will not melt in the sun or in a hot car in summer. Moldable wax ear plugs soften in response to body heat and may very well be the most comfortable ear plugs for sleeping you will find anywhere. Made of a wax and cotton blend, these ear plugs are perfect for sleep and study in mildly noisy environments. Best for sleeping.